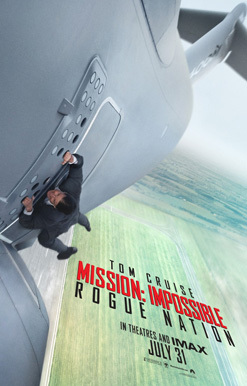 “Mission: Impossible – Rogue Nation” is the fifth movie in this series, based on the popular 1960s television series. While “Rogue Nation” may not be quite up to the same high level as “Ghost Protocol” (2011), it’s certainly very entertaining in its own right. Tom Cruise returns as Ethan Hunt, the head agent of the Impossible Mission (IM) Force. Part of the fun of the movie is seeing Cruise, at 53, perform his own stunts, which include hanging on to an airplane during take off! Writer-director Christopher McQuarrie provides many thrills including a terrific, edge-of-your-seat sequence in which Hunt tries to prevent an assassination at the Vienna Opera House during a production of “Turandot.” There’s also an exciting motorcycle chase through the streets of Casablanca. The plot involves Hunt’s investigation of Solomon Lane, a man who appears to have connections to terrorism. Meanwhile, back in Washington, a Senate subcommittee is investigating the IM Force, with plans to shut it down. Working undercover, Hunt encounters a beautiful and mysterious woman agent named Ilsa (Rebecca Ferguson). Whose side is Ilsa on? I won’t give that away! “Rogue Nation” has been one of the summer season’s biggest hits. It’s easy to see why. It’s a satisfying and entertaining thriller with high production values. This “Mission: Impossible” film follows the formula of the TV show and other movies, including the famous theme music and self-destructing tape. It’s familiar enough to be comforting, with enough new characters, plot twists, and state-of-the-art technology to keep things fresh. Enjoy!